In our earlier articles, we have learned how to loop over ArrayList in Java and you can use the same logic to loop over a TreeSet. 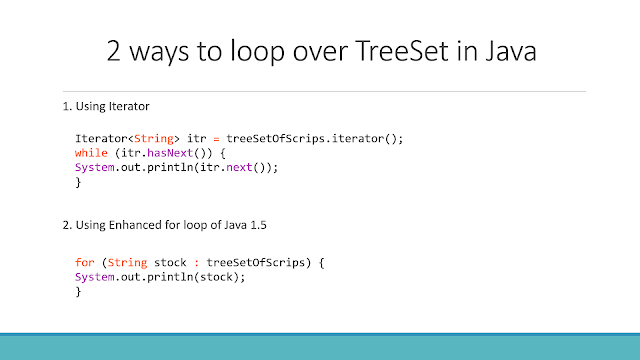 You can use both, enhanced for loop and Iterator to traverse over TreeSet in Java. Though, worth noting is that Iterator returned by the iterator() method of TreeSet returns elements in the sorted order which is imposed by the Comparator you have provided to TreeSet at the time of instantiation. By default, if you don't provide any custom Comparator than TreeSet sorts elements in their natural order e.g. String elements are sorted in alphabetic order and Integer elements are sorted in numeric order. When you iterate over a TreeSet the iterator follows this order. You can also use the enhanced for loop, which also internally uses the Iterator and traverse the TreeSet in the same order, but you cannot remove an element there. On the other hand, Iterator allows you to remove elements while iterating over TreeSet. In this article, you will find the examples of both approaches. For those who are new to TreeSet, A TreeSet is a sorted collection in Java. You insert an element in any order but when you iterate through the collection, the values are automatically presented in the sorted order. The sorting is accomplished by a tree data structure. The current implementation of java.util.TreeSet uses a Red-Black tree. For a detailed description of red-black trees, see a good algorithm book e.g. 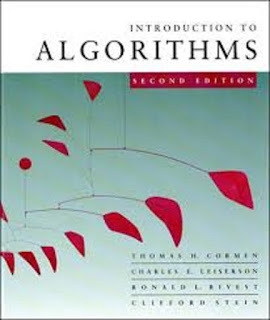 Introduction to Algorithms By Thomas Cormen, Charles Leiserson, Ronald Rivest and Clifford Stein. Every time an element is added to a tree, it is placed into its proper sorting position. Therefore, the iterator always visits the elements in sorted order. You can follow 3 steps to start iterating over TreeSet using Iterator, remember this is going from first to last element in the sorted order. You can also remove the current element by calling the remove() method of Iterator, don't use the remove() method provided by the java.util.Collection interface because that will result in ConcurrentModificationException as shown here. Here is the sample code to loop over TreeSet using advanced for loop, Remember you cannot remove elements when you are using enhanced for loop of JDK 1.5 release. There is also a third way to iterate over TreeSet in Java but that is only available from JDK 8 onwards. You can use the forEach() method to iterate over any Collection including TreeSet in Java 8 because this method comes from java.util.Iterable interface. Here is our complete Java program which shows step by step guide to iterate over TreeSet in Java. This program contains both examples i.e. iterating over TreeSet using Iterator and using enhanced for loop of Java 5. That's all about how to iterate over TreeSet in Java. You can use any of the approach to loop over a TreeSet but the recommendation is to use Iterator particularly if you want to remove elements from TreeSet while iterating over it. You can use enhanced for loop for just accessing the elements e.g. for printing contents of TreeSet. This approach is similar to Iterator but results in cleaner code.